Seven Samford University students and one alumnus will compete Feb. 5 to have their compositions played during a Birmingham performance by SYBARITE5. The Feb. 5 contest begins at 7:30 p.m. in Harry’s Coffeehouse, located in Samford’s Beeson University Center. The event is free and open and to the public, but advance reservations are encouraged. SYBARITE5, the first string quintet to ever win the Concert Artists Guild International Competition, will be in Birmingham to perform Feb. 6 as part of Samford’s Leslie S. Wright Fine Arts Center Signature Series. Audience members will text to vote for the piece they liked the most, and the winning composition will be premiered at SYBARITE5’s main concert Feb. 6 at 7:30 p.m. in Samford’ Jane Hollock Brock Recital Hall. The current students include Sarah Allen of Fort Worth, Texas; Maggie Boswell of Frederick, Maryland; Adam Cobb of Madison, Alabama; Gavin Fulmer of Chelsea, Alabama; Chadwick McDowell of Birmingham; Kyle McGucken of Birmingham; and Brianna Ware of Gadsden, Alabama. Brian Nabors, a 2013 Samford graduate, is currently working toward graduate degrees in composition at the College-Conservatory of Music at the University of Cincinnati. 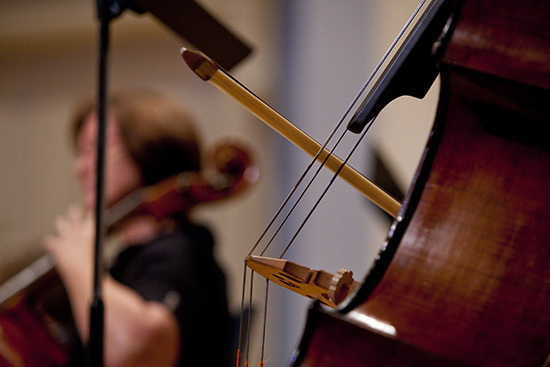 Six of the eight students are music composition majors with performance experience in such areas as voice, piano, organ, French horn, guitar, and violin. Pioneered in 2010 at the HuB Incubator in Sarasota, Florida, New Music Idol partners SYBARITE5 with collegiate-level composition students to foster new works for string quintet. Aided by professors, students study music composed for SYBARITE5 and then create short competition pieces that are performed and critiqued in an “American Idol” format. The new compositions are performed in a live casual concert setting complete with a panel of judges and a winner is chosen via live text-to-vote system. New Music Idol transforms classical music composition into something relevant and exciting for audiences, composers and performers. SYBARITE5 has made its name by blurring classical and rock motifs, earning praise from critics and audiences alike. Playing a repertoire that ranges from Mozart to Radiohead, SYBARITE5 utilizes exquisite musicality and a dynamic performance style to turn heads throughout the music world and break the boundaries of what a string ensemble can be. This performance is the culmination of a four-day residency working with local music composers and students. SYBARITE5's performance is funded in part by a grant from South Arts in partnership with the National Endowment for the Arts and the Alabama State Council on the Arts. Other sponsors include Weld for Birmingham, Birmingham Mountain Radio, Yelp! Birmingham and Taziki’s Mediterranean Café. Samford University also is a partner of Create Birmingham.